Cape Report: "ANC becomes the disease, not the cure"
South Africa seems no longer able to contain the contradictions and frustrated expectations that have been swept under the carpet since the country’s first freely elected government came to power in 1994. With new elections due in 2014, there is increasingly evident public anger at the governing African National Congress (ANC) — the party of liberation from apartheid and white minority rule — over its failure to meet its pledge to provide a better life for all. Instead, the ANC has become a deeply corrupt party of cronyism and patronage. Indeed, holding ANC positions in governments at all levels has become such a sure route to wealth that aspirants will murder to get them. Last week, Reuters news agency reported that an internal ANC report states that in KwaZulu Natal — the largest of South Africa’s nine provinces and the home base of President Jacob Zuma — 38 party members have been murdered since February last year in fights for lucrative positions. There are similar murderous contests among ANC members all over the country. A potent image of the benefits of power now enraging many South Africans is that the equivalent of $27 million of government money is being spent on renovations to President Zuma’s private KwaZulu Natal home. An auditor’s report from another major province, the Eastern Cape, in 2009 found three quarters of all government contracts went to companies owned by government officials or their relatives. A report by the national Auditor General last year found 95 per cent of all municipal governments could not account for their spending. Yet while South Africa has acquired this hugely wealthy and arrogant black aristocracy — and one of the widest disparities between rich and poor anywhere in the world — most of the country’s 50 million people live in the conditions of extreme poverty that marked the era of apartheid. Despite a lot of talk and some accomplishments involving improved housing and social services, most South Africans continue to live in tin shacks without running water or electricity. The health care system is a nightmare, and the school system is incapable of producing talent. The unemployment rate among young people is over 50 per cent. By some estimates, about 65 per cent of South Africans live at what the United Nations calls levels of extreme poverty, even though this is the largest and most sophisticated economy in Africa. And as has been seen in the last two months, even those with jobs often cannot make ends meet. The strike at Lonmin’s platinum mine at Marikana in August by miners demanding a living wage has spurred a wave of wildcat strikes involving at least 100,000 miners across South Africa’s essential ore extraction industry. The grimly compelling images from the Marikana strike were straight out of the worst years of apartheid, with police lobbing volleys of rifle fire on the strikers, killing 34. 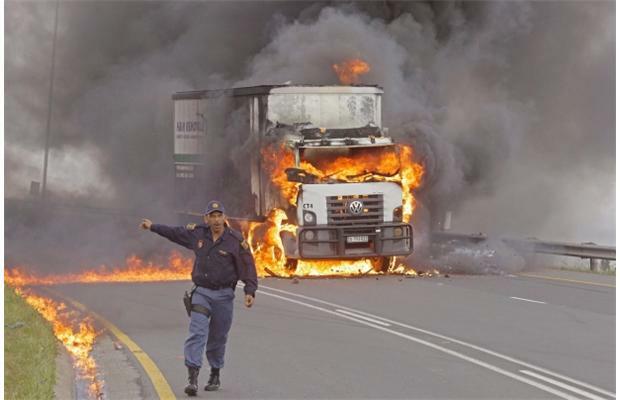 The violence has continued, and the strikes have spread to the trucking industry and among municipal workers. Predictions that South Africa belongs with Brazil, Russia, India and China as a future economic power are being re-thought fast. The lack of response to the Marikana massacre by President Zuma and his government has reinforced his image as an ineffectual leader of an administration concerned only with its own bank accounts and assets. Zuma, who came to the ANC leadership and the presidency in 2009, has been under attack from within the party for some time. Most evident has been his very public fight with the radical former leader of the ANC Youth, Julius Malema. Since his expulsion from the party, Malema has set up his own youth league, and his brand of direct activism — such as the forced expropriation of the remaining white-owned farms — assures him a strong following among young ANC members. But Malema — who at 31 has acquired a substantial real estate empire, wears lots of gold, drives opulent cars and likes to drink expensive Scotch — is hardly a poster boy for reform of the ANC. Neither are the other challengers to Zuma’s leadership who are quietly but purposefully lining up ahead of the ANC’s national meeting early in December, when its presidential candidate for the 2014 national election will be chosen. Chief among them is the current Deputy President, Kgalema Motlanthe, 63. He has good credentials for an ANC leader. He spent 10 years in Robben Island prison with Nelson Mandela after being convicted of membership in the ANC’s armed wing, Umkhonto we Sizwe. But while Motlanthe is behaving like a man who is a candidate, he has not come out and said so. Also, he is just as much a member of the ANC’s corrupt ruling class as is Zuma. Already some of the ANC branches in the smaller provinces have chosen to back Motlanthe at the December conference to be held at Mangaung near Bloemfontein. But it will be the brigades of delegates from the big provinces that decide the issue, and for the moment it is likely that Zuma will get a second term as president. What seems unlikely is that South Africa will get a second crack at the promise of renewal made 20 years ago. Awesome article, I am very happy to read the article. In this site I find new information about south africa.